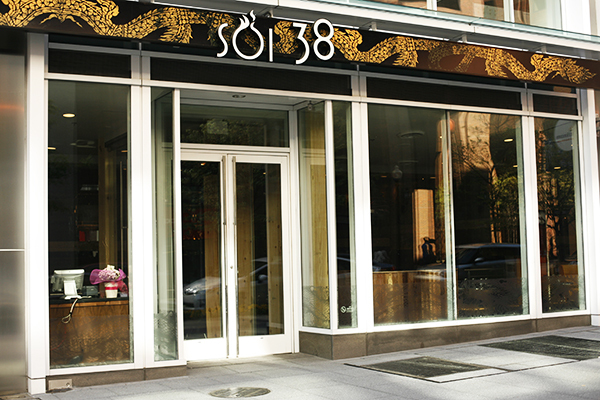 Soi 38 will open its doors on L Street on Monday. The new restaurant is owned by the same owners as Thai Place and will offer specialities sold on the streets of Bangkok. The owners of Thai Place will open a new Southeast Asian street food restaurant Monday as they prepare for the longtime Foggy Bottom staple to close this year. Soi 38’s upscale location at 2101 L St. will feature a seasonal menu with slightly pricier Thai specialties, said Dia Khanthongthip, the Bangkok native who has owned Thai Place for 10 years. At the new West End establishment, customers will sit in booths lit by bamboo chandeliers and sample some of the dishes from the Thai Place menu, such as Tom Yum Kradook Moo, a soup cooked overnight and seasoned throughout the day. A local mixologist will also update the cocktail menu, infusing Thai herbs like lemongrass and ginger into drinks. She hopes Soi 38, which began construction last year, can eventually expand into other D.C. neighborhoods as well as Maryland and Virginia. At the new L Street location, the walls are covered with hand-painted elephants and dragons. Khanthongthip said though the decor will be more upscale, the restaurant will still welcome students, local workers and tourists when it opens. The longtime Pennsylvania Avenue establishment will close its doors in the next year as the University begins constructing a new office building. Khanthongthip said she has not yet received a move-out date from GW but will miss the restaurant’s current location. “I like being here because it’s close to campus, and we’ve been here for over 10 years, so we know everything here – the students, the people working around here. We really love this location,” Khanthongthip said. Sophomore Jessica Mandell, who frequents Thai Place, said that as long as the prices do not change much, she and her friends will walk the few extra blocks to the new restaurant. “I have always loved Thai food, and everyone who works there is very sweet. I have so many great memories from freshman year and this year,” Mandell said. This article appeared in the April 28, 2014 issue of the Hatchet.